In this page, you can find step-by-step guides on video deleted recovery, including how to recover deleted videos from SD card, PC, and iPhone. If you are troubled by video data loss issue, continue reading this tutorial and you’ll be able to retrieve deleted videos easily on your own. For most of us, it is common to use various digital devices such as computer, mobile phone, camera, etc. These devices can store and manage all kinds of files, such as photos, music, video, email, documents, etc. Many users would like to take videos or photos to record important moments and store videos file on hard drive, external disk or phones. However, only a few part of users have to habit of backing up in time, which many a majority of users do not have additional copy of those important files. As a result, they are likely to encounter data loss issue. Because files can get lost due to a verity of reasons, such as accidental deletion, formatting, RAW drive, partition corruption, partition loss, virus, system issue, etc. Accidental deletion of important video is awful experience, and yet you can overcome it if find right software. In many cases, video deleted recovery is available. When a video file gets deleted, it is not permanently erased from storage device, for system only deletes entrance instead of the entire data. As long as sectors occupied by deleted videos are not overwritten by newly stored data, you have good chance to get deleted videos back. Video deleted recovery software has the ability to scan the disk and restore lost videos and other files. DiskGenius: it is a versatile tool and it covers a wide range of functions related to data recovery, partition management, data backup, and disk utilities. The data recovery function is effective and powerful. It supports to recover deleted or lost documents, email, video, pictures, music files, etc. As to video deleted recovery, it has specialized scanning algorithms to identify and restore all types of video formats such as AVI, MP4, RMVB, MOV, MPG and so on. This application recovers lost data from all kinds of storage devices including internal/external hard drive, SD card, USB flash drive, pen stick, virtual disk and more. Moreover, it works well when recovering videos from NTFS/FAT32/exFAT/EXT2/EXT3/EXT4 drives. Eassos iPhone Data Recovery: if you are looking for iPhone video recovery software, Eassos iPhone Data Recovery is a good option. 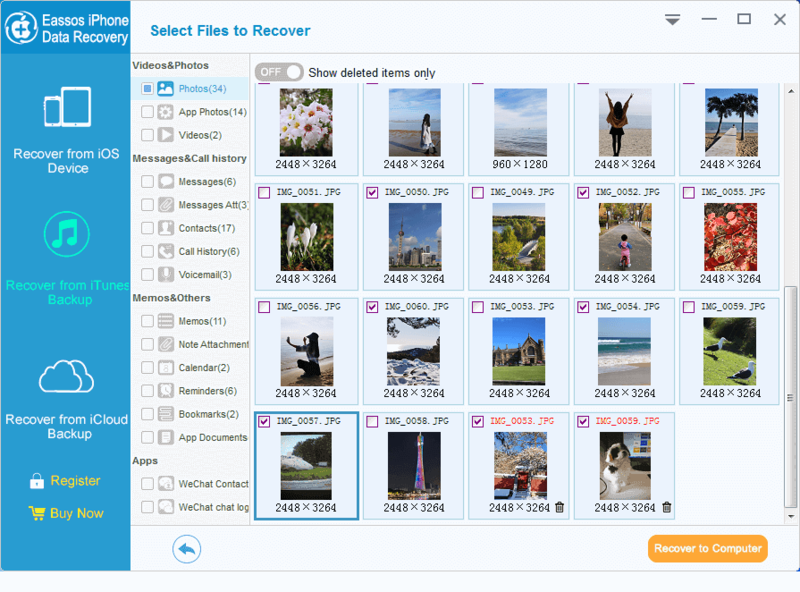 It enables you to retrieve lost videos, photos, message and other files from iPhones easily; it supports recovery of data lost due to deletion, factory restore, system upgrade/downgrade, jailbreak, etc. It provides three recover modes and helps to recover data from iOS device, iTunes backup and iCloud backup; file preview is available prior to purchase, thus you can test the program and check if it meets your needs. Video deleted recovery guide 1: how to recover deleted videos from SD card & PC? Step 1: Launch DiskGenius, select the drive where deleted video files were store and click File Recovery button; This opens the Recover file window, as below. Step 2: Select recovery options and click Start button to search for lost videos. It is recommended to follow default setting here, which can find as many files as possible. 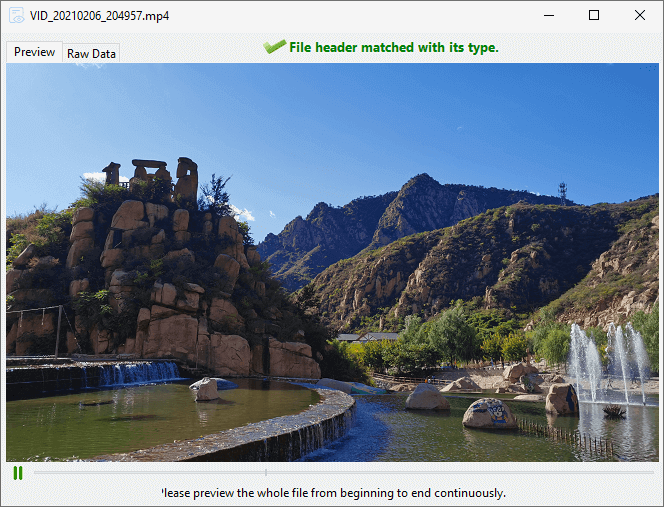 Step 3: Preview recoverable videos. You can preview video in scanning result by double clicking a file, and the video file will play in a pop-up window, as follows. If the video can play from beginning to end without problem, then this file is not damaged and can be recovered correctly. Select files and folders you need and right-click on selected data to choose Copy To. After that, you can set a location on your own so as to save recovered videos. Video deleted recovery guide 2: how to recover deleted video files from iPhone? Eassos iPhone Data Recovery can be used to recover deleted images, pictures, photos, contact, message, call history, notes, etc. from all kinds of iOS devices, and here is the guide to recover deleted photos and videos. 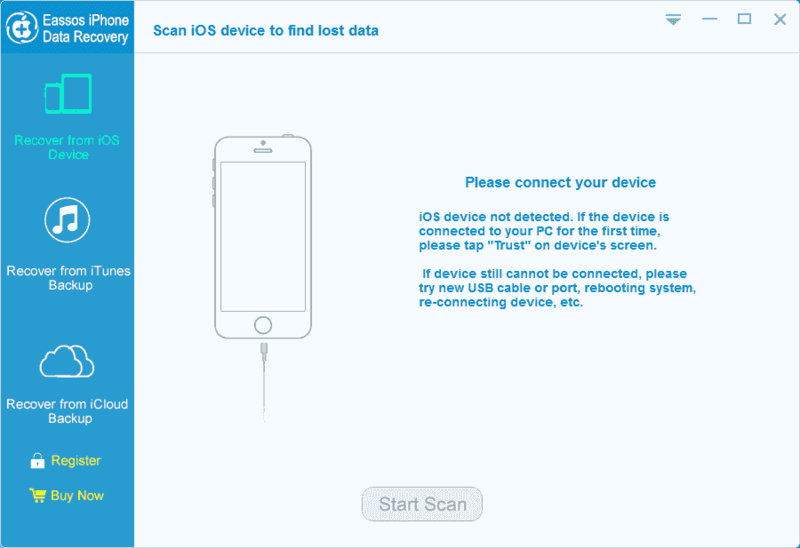 Step 1: Install and launch Eassos iPhone data recovery software from computer and connect the device to be recovered. Step 2: Choose recovery mode from the left pane and start scanning process. This tutorial article talked about approaches to do video deleted recovery and all guides are easy to learn. We hope you become able to recover lost and deleted videos and other files when necessary. Though the recovery process is easy, we still should not ignore the importance of data backup. If you have any questions or need any help on deleted data recovery, please feel free to contact our support team. This entry was posted in Data Recovery and tagged how to recover deleted video files from iPhone, how to recover deleted videos from SD card, video deleted recovery, video recovery software by EASSOS. Bookmark the permalink.